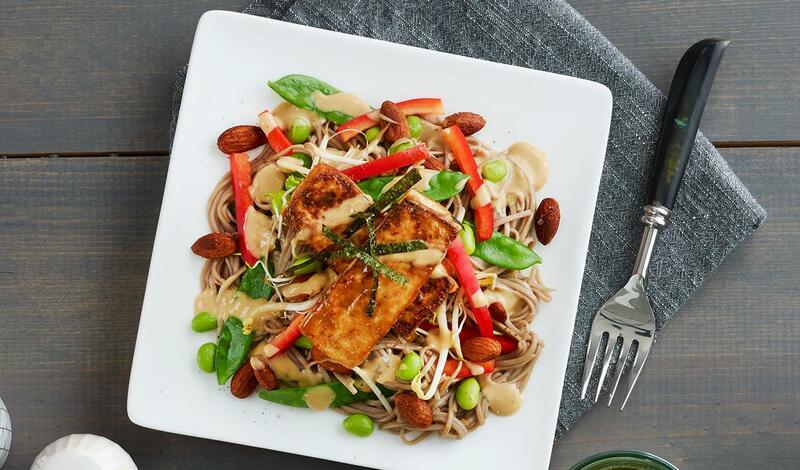 Soba noodles tossed in Hellmann’s® Sesame Thai Vinaigrette, then topped with edamame, bean sprouts, snow peas, bell pepper, spiced almonds and miso marinated tofu. Finished with house made umami dressing. To make miso marinade, combine sesame oil, mirin, miso paste, and soy sauce. Whisk. Drain and pat dry tofu and pan fry with vegetableoil until crispy. In a mixing bowl, combine crispy tofuwith marinade and toss until the tofu is coated. Combine all ingredients and toss until almonds are well seasoned, roast in the oven at 180°C until toasted. Combine all ingredients and whisk until uniform. Combine Hellmann’s® Sesame Thai Vinaigrette with soba noodles and toss until coated. Drizzle the Umami Dressing over the noodles. Top with remaining ingredients.